The autumn has finally come. Each morning is dryer and cooler than the day before it. A bridge spans the distance between to place, two ideas, two sides. As a vision we sit with hook and line slightly drifting attempting to hook the dreams, the dreams we envisioned in our youth. I stand on one bridge looking out over another thinking back to those dreams of two bridges side by side. One that was rusted and flat reaching far into the horizon, the other arching up into the sky. Two ways to cross from here to there, which one I would choose would determine a course in my life. Here I am thousands of miles away thinking back to the flicker of my mind images as a stranger in a strange land. Fishing for those dreams, casting the soul into the current. Sharpening the hook to catch the spirit. 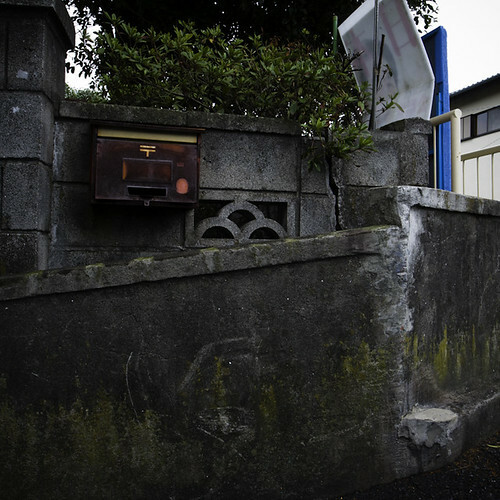 There is a house on an old street in Urayasu. The house dates back to the late 19th century and luckily the city of Urayasu has seen the benefit in preserving the home as portal back to Urayasu’s own past. All of the wood in the home is well burnished to a golden mahogany hue. The home shows its age just as the rings in a tree’s trunk do. All sharp edges have been smoothed over as countless hands have slid the shoji (障子) to let in the light and air over the decades. This day in I as wandered around the home with my students I was struck by this one small corner’s glow. 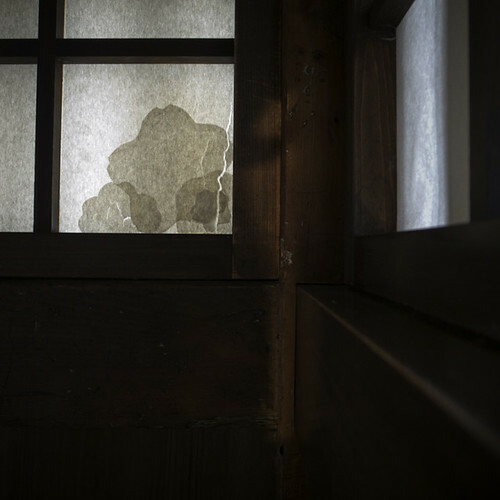 The light was softly diffused by a patch working of a flower over a spot of torn paper. 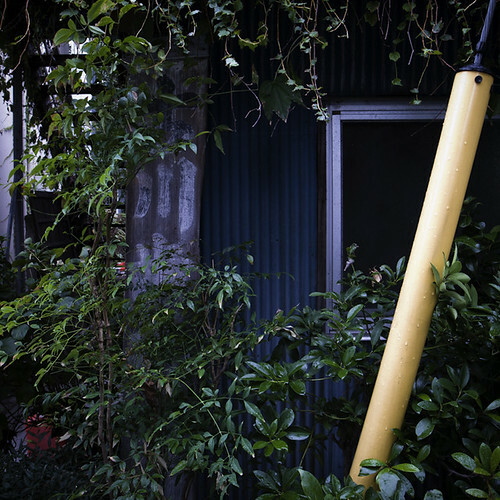 The light was my conduit to Japan’s past that has vanished from daily life. A time before electricity and gas in the home. A time in which the only light in the home was that that filtered though the washi (和紙) paper, or by small oil lit lamps. In this tiny corner of a house that time has forgotten on a street that is rapidly vanishing I glimpsed Japan’s past as the light illuminated a corner of my soul. Walking in the Rain All for the Love of Photography. The rain wasn’t suppose to come till this afternoon, but it didn’t work out that way. I taught a small gathering of photographers who attended an UFRA workshop on creative photography. There will be more about this class, when I get some of the images that the participants took. It was great to walk around with them all in the rain helping them to see the wold around the. We walked around the old part of Urayasu on flower street. We went into the old fisherman’s home, and doctors home and had a little impromptu tour by the on staff volunteers. The students clicked away happily and asked me for help from time to time. It was a beautiful day out and more to come about the day and the class, once I get the images from the students. All for the love of photography. I hope I can inspire more in young and old to use photography as a means to express themselves and seek the beauty around them. This the last of my archiving projects for a little while. It all started with the finding of my color analog prints that I made after hurricane Andrew and published on the 20th anniversary of that terrible storm. It led me to redux my Broken Windows book. Now I decided to take a new look at the project that I completed before Broken Window, and was only published as an artist’s proof. I have decided to call it Tampa Friends, Tokyo Tomodachi (tomodachi means friends). These images were all taken in 1991 with a Nikon FG mostly with a heavy flash. I was photographing what was around me, my friends. I spent so much time with all of them that I wanted to capture those moments. It was my way or participating in life as both an observer and participant. The book is split into two halves. The first half is filled with my Tampa family of Jahn, Christopher, and Elizabeth. We spent all of our free time together exploring life and the land around Tampa. The second half of the book comes from two different trips to Tokyo and the time I spent with Tetsuya, Yoshinori, and Masami. The two halves show a version of my life as it was in 1991. A time when my friends were my family. By 1991, I rediscovered my love of photography after having a passion ignited in my soul from cinema. I wanted to go one step further and enrolled in a photography class. A whole new world opened up before me. I learned about photographers I never knew before. I was eager to discuss the deeper meanings of photography, and that passion that was reignited by my teacher Beth Shields never has diminished. 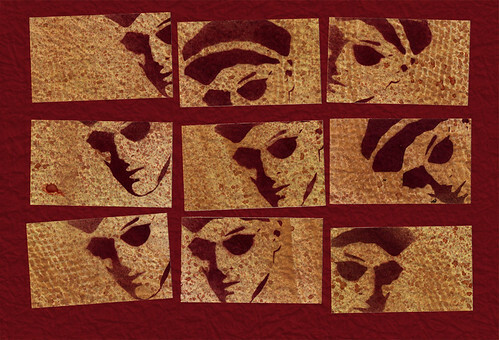 I wanted to look at these old photographs of mine to see where I have been as an artist. I wanted to know if the images that I were producing in my youth were still valid to my critical eye 20 years later. The answer, for the most part, is yes. It has been a process of learning and self discovery with my camera as my means of expression. the book can also be purchased online via Blurb. Lastly I want to give a extra special shout out of love to all those whose images are contained within the book Tampa Friends, Tokyo Tomodachi. All of you made my time as a young man some of the most interesting and heartfelt years of my life. As we get deeper into autumn the twilight creeps up so quickly. It seems as if the golden moments of the setting sun fade into night. The moon was out early this evening high in the sky. 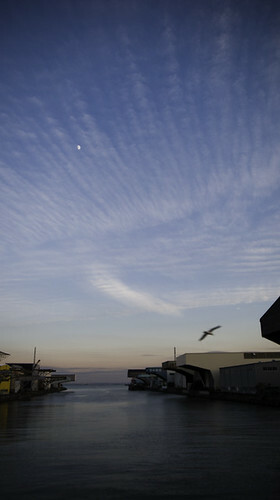 Seagulls waltzed under rippled skies. The luna in all its majesty smiler a happy one as it too watched the aerial display. Swooping down on its dinner the birds would skim the water. Looking for that meal so that they could be satisfied. All under the moons watchful eye. The more terrestial rippled clouds gave way to a obsidian water. They danced. I watched. The sun continued to set. I came across this bordering adornment in Saitama the other day between two small apartment complexes. The owner of one of the apartments had lined the property line with small 100 ml steel cans. They must have been arranged there quite some time ago as most were in various stages of oxidization. Additionally, weeds sprung out of the tops of a few of the cans. It was quite a harmonious mixing of Japanese aesthetic of wabi sabi, reusing of discarded items, and the beauty of contemporary design. This was the line that should not be crossed, even though it stood little more than a few inches tall. The border was completely dwarfed by the surrounding multi-storied buildings. The idea of what is a border began to spin around in my head. Why do humans choose to mark boundaries? On this side of the line is what is mine, and on the other is yours. Will these borders last, or will they crumble into tiny pieces of oxidized dust? This border will not last. I wonder if the land owner will find is necessary to replace these cans when they are no more? 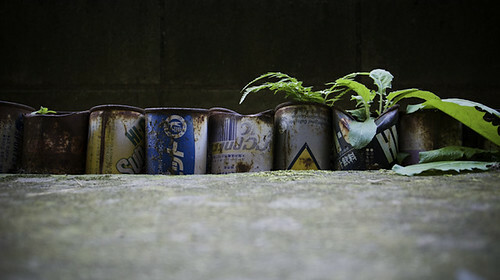 Just some cans, rust and thought from across the border from Tokyo, into Saitama. A collection of little name cards I made to hand out at a small art gathering last night. I actually got inspired around midnight the night before to show. I went over to my studio shook up a few cans of spray paint and made this little name cards. I am pretty happy that I made them. They came in handy at the show to hand out to some people who had come by to check the work and enjoy some good times. You have to let your nose be your guide, or at least that is what I did. That sweet fragrance of the the unmistakable kinmokusie ( 金木犀) drifted into my nostrils right before lunch. My stomach was rumbling wanting to be nourished, but the scent drew me in. As usual I had no idea where the scent was coming from. I knew it had to be pretty close by. I wandered around for a bit, and to my astonishment, there were three of the largest orange sweet osmanthus I had ever seen. The tiny blossoms were bursting all over the trees. The trees were peeking as I strolled under their branches. I noticed the the earth had begun to be dotted by them. Little orange specks were scattered around the roots of the trees. 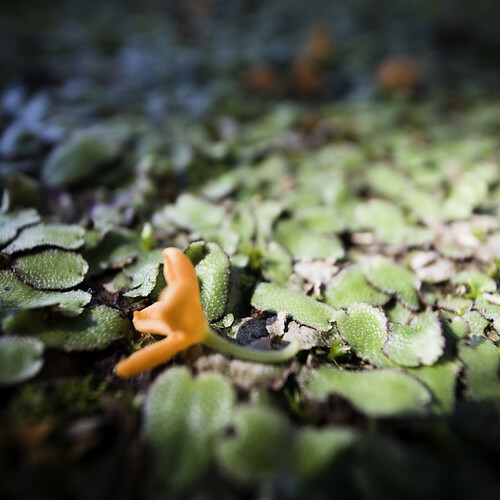 These little orange drops of fragrant dew had done their mission for the year, and sat patiently on a bed of green ground coverings to seep back into the soil. The dew has begun to fall, another sign of autumn, and another signal that the crisp air will gradually dip closer and closer to freezing. For now, I am content just being able to witness such a seasonal sensory festival of aroma. The morning dew hung with a brisk moving stillness. Wind whipped around my head. Trying to think of warmer days, summer days, or at least a warmer coat. Stepping onto the warmer comfort of the bus, I made my way to the back seat. So thankful for a warm seat, and a window with a view. The clear rippled skies reflect on the liquid asphalt puddles. Gazing into the sky, I think to myself, today is a good day. 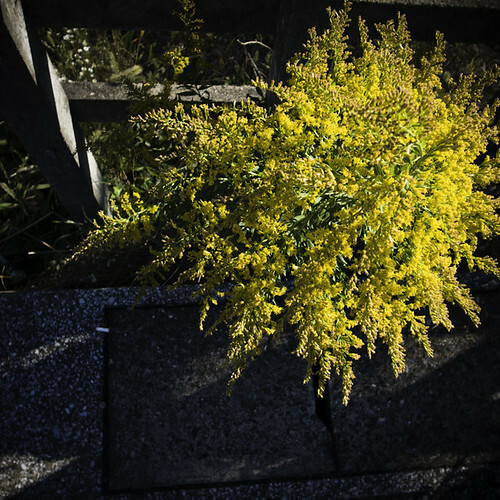 The goldenrod nodded a greeting in the warm afternoon light. Bursting with hue, in ways only a weeded flower could. Today is going to be a good day, I know it to be true. No matter what may come, the light will shine. Being in tune with the natural surroundings makes the coming of the seasons so pleasurable. 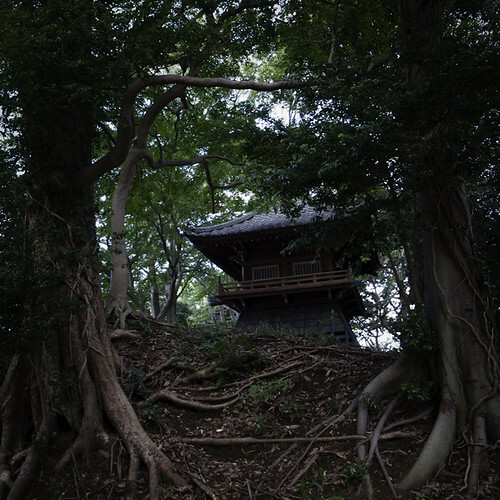 It is one thing that Japanese culture is in sync with, nature. It may not seem it, but if you could ease drop in on a conversation in a tea house one of the appropriate subjects for this time of year would be the blooming of the 金木犀 キンモクセイ(kinmokusei), Orange Osmanthus, also known as fragrant orange. This tree is not beautiful. It looks the epitome of completely ordinary. Through out the seasons it is just a tree, with branches, leaves and roots. One would walk by it and not even give it a first thought. It is a tree that is just there. This is when the magic really happens. 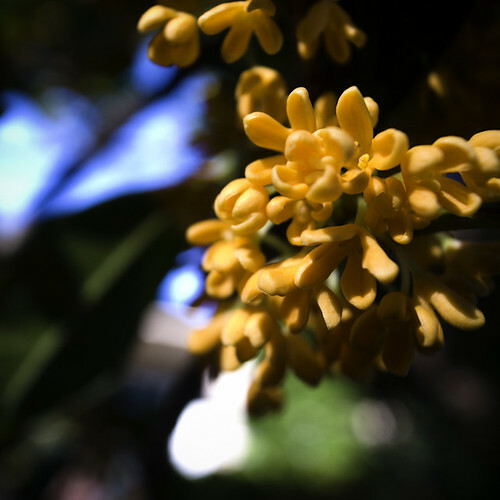 For about a week to 10 days the minuscule blossoms of the fragrant orange osmanthus open and release their scent into the world. I always smell the fragrance before my eye spots the tree. The sweet orange scent with hints of cooking butter waif through the breeze. I like to search for the tree once the aroma hits my brain. I love to let it fill my nostrils in the cool dry air of autumn. This little unassuming tree becomes extraordinary, if for only a few days. It is well worth the effort to track them drown and let your mind drift on the buttered orange waves of autumn. Friday afternoon at 2 p.m. there was a rather large and close earthquake in Chiba Prefecture. It was large enough that I considered abandoning the building, but the earth began to settle back down again. I will never say that I am used to the earth suddenly getting its own mind and beginning to shake, but I no longer panic at the start of the movement. I finished up my day. The air was dry, with a slight breeze blowing. The air had just a tinge of coolness to it. But I still needed to roll up my sleeves to be comfortable. It was a beautiful afternoon to be heading back home to ready for the sabbath. I get to the station, and it appears to be more crowded than usual. I don’t really pay it any mind. I pull my headphones over my eyes and listen to Haydn’s 6th symphony. I take a seat and just gaze out into the station. The trains don’t seem to be coming, but I assume that I just missed one, and one will be along in 10 minutes or so. Finally I hear the station master making an announcement that the trains are delayed and one will be along shortly. Since I have time to spare, I wander around at the edge of the station. 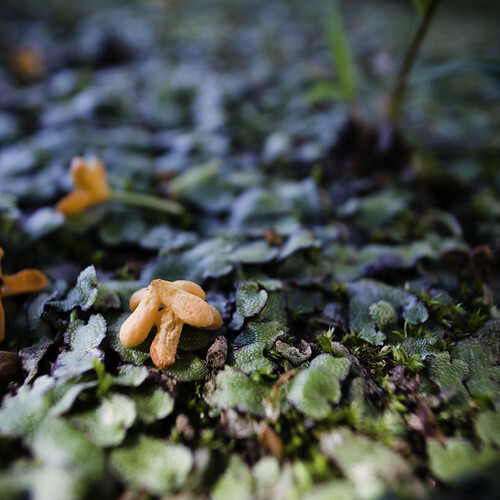 There were all these micro landscapes waiting for me to discover. 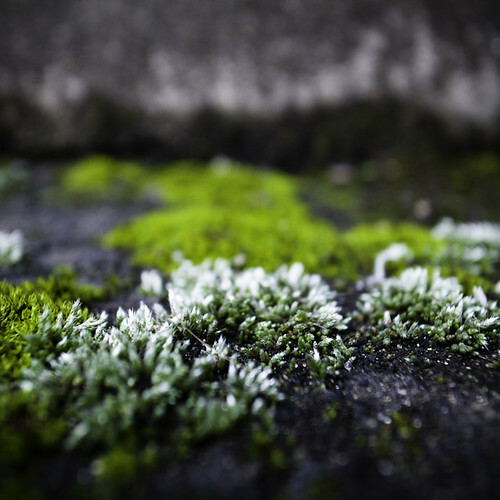 Bits of moss, weds, and lichens that had made their home in this station in the Narashino section of Chiba. Time, is all we have sometimes. It often those moments when we are waiting for something to happen that life is at its most beautiful. Shabbat shalom. May you all have a beautiful and needed day of rest. Today I was talking to a good friend of mine who has been going though some tribulations. There are times in our lives no matter what we seem to do that the events in our have a way of dragging us down. My friend commented that what actually lifted him up and over the much of everyday life was some poetry. They were in fact a collection of haiku. It was art that lifted up his soul and refreshed his spirit. I too find that art has the power to lift me out of depression. Art has the power to wipe the stains of life clean as I search out inspiration from the world around me. I am surrounded by concrete; therefore, sometimes the only nature I am exposed to are confined to terra-cotta pots. The largest recent inspiration comes from the skies above. Today it came in a garden at a Buddhist temple. I find it so relaxing that after a day of work to wander through this temple on my way back to the station. Today a pair of large trees, with gnarly roots captures my soul. I, of course, had passed them hundreds of times, but today was different. I stood and watched them. 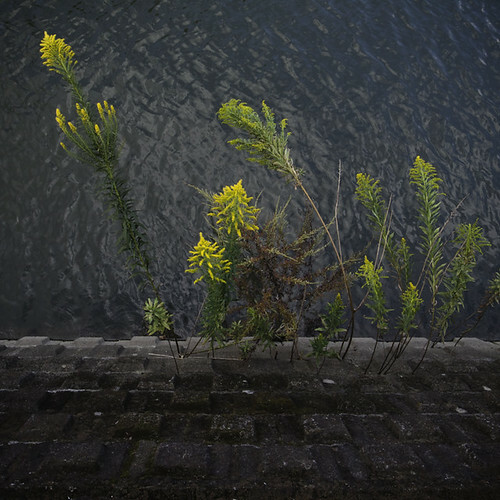 Some goldenrod also caught my eye as it was jetting out from the edge of a canal. The earthy yellow pollen may be aggravating my allergies, but the colors are so soothing to gaze upon. 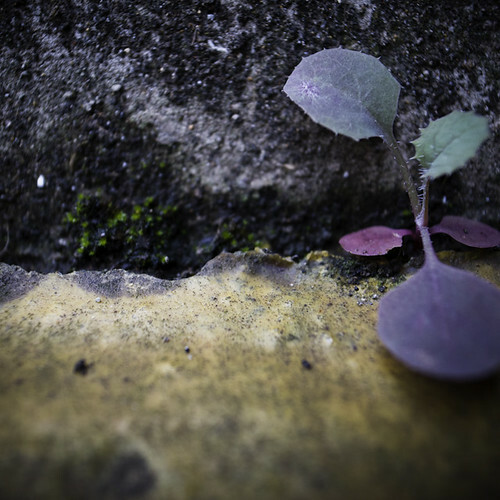 It is these little encounters with nature in an urban world that make my day. I hope that others out there can reap the benefits of being in tune with the natural world around them. This is a test, a surreal test of your attention. It was a hot and humid last day of September when, Urayasu city held its annual Emergency Preparedness Drill. 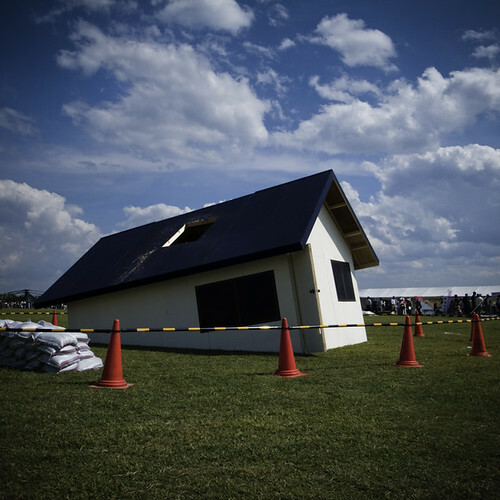 The city in conjunction with Chiba Prefecture, and the National government organized an event to inform its citizens of the facilities in what to expect in a disaster situation. 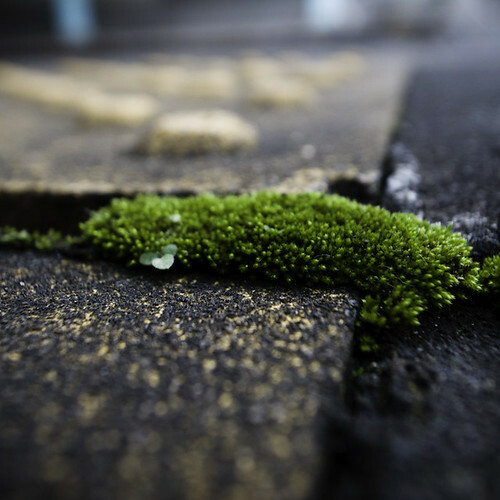 This of course takes on even deeper meanings since the March 11, 2011 earthquake that devastated Tohoku region of Japan. 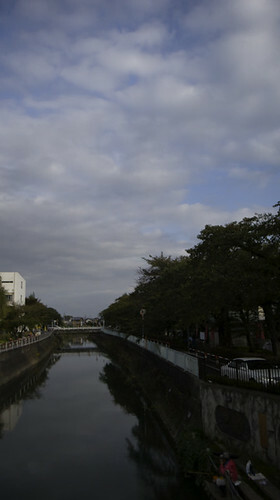 Outside of the Tohoku region, Urayasu suffered the worst damage mainly due to liquefaction. The police, military, and emergency services all had set up displays, and interactive events to help the people of Urayasu. I am not sure if i found it comforting or disturbing. They say (whoever they might actually be) that Japan is does more preparation than any other country in the case of disaster strikes. There are always drills, and mock events to test the readiness of the people, and its emergency services. This is good; however, one can never fully prepare. There is always, and most likely the chance that something will go wrong. I do commend the patience of the Japanese people in response to the March 11th triple disasters. I think they did a fabulous job of coming together in the hardest hit areas. That brings me back to this surreal event unfolding before my eyes. Seeing the water tanks that would be used, and in the case of recent events, were used. Witnessing Disney-cutesy characters of a soldier, a police officer and an emergency worker, was truthfully made my stomach turn. In the end I am glad I went. It was surreal, a surreal test indeed. You are experiencing the archives for October, 2012.